This is unexpected but really terrific: a 6+ and top 10%(I feel the pressure mounting wondering how to keep this up in the future :-) ). 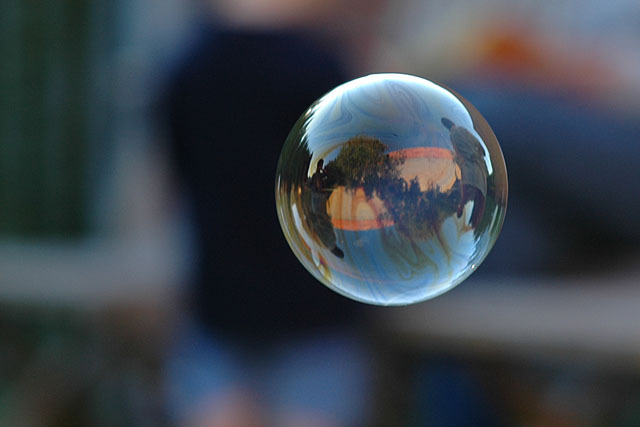 I was pleased with the bubble itself, but less so with the background and the reflection. There was no time left to shoot another one, so I submitted this picture hoping for a 5+. Thank you all for the nice and helpful remarks and for the great scoring. You have donea marvelous job capturing this bubble. I love the visibility of the soap suds swirling in it's body. Great soft background too. Well done. I personally like it, but I'm betting people will talk about how the reflection/ background is distracting... Good luck! Sharp. Nice bokeh. Nothing distracting. Very neat! Reminds me of the yin and yang symbol. The blurred background is excellent and so is the originality feel to this phot. Would have loved to have seen something a bit brighter in the reflection though. The beigy building tends to make it a bit dull feeling expecially with that great background. "7"
Nice to see a sharply focused bubble. Nice use of a blurred background. I like it. Proudly hosted by Sargasso Networks. Current Server Time: 04/20/2019 10:10:11 PM EDT.